A stop in Amsterdam offers the chance to explore the sights of one of Europe’s most colorful, dynamic and historic cities—one with a well-earned reputation as a laid-back and inviting place for people of all stripes. Visitors are naturally drawn to the historic city center where you’ll find some of the world’s top art museums, including the Rijksmuseum and the Van Gogh Museum. And at Dam Square, the Amsterdam’s largest public square, you can tour the Royal Palace before continuing to the tourist attractions on the Canal Belt. The iconic network of waterways that surrounds the downtown area offers a picturesque backdrop for sightseeing by bike or canal boat. Be sure to visit the floating Bloemenmarkt to peruse famed Dutch tulips, and take time to wander and window-shop among the narrow lanes of de Jordaan. And you won’t have to look far in Amsterdam to find delicious Dutch treats along the way. Just duck into a cozy brown café to sample a plate of bitterballen with mustard and a beer, and grab a gooey sweet stroopwafel from a street vendor as you stroll. Oslo, Norway’s charming capital city, is a vibrant mix—modern architecture and world-class museums dwell alongside 10th-century Viking history, with indigenous Sami culture woven throughout. This cosmopolitan center, with its coveted quality of life, caters to every interest from history buffs and literary types to students of modern Nordic design and aspiring arctic adventurers. Choose the Oslo you want to visit. Take in the much-talked-about Opera House, with its otherworldly angles, or trace the steps of Nobel Peace Prize laureates and literary masters like Henrik Ibsen. 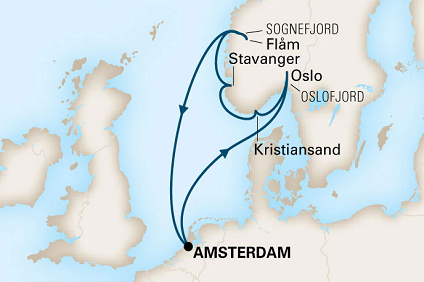 Journey to the Bygdøy peninsula to absorb Nordic culture at the Viking Ship Museum, the Fram Museum and the Folk Museum. Savor fine restaurants and luxury boutiques along the Aker Brygge waterfront, or dive into the eclectic neighborhood of Grünerløkka for vintage shops, microbreweries and corner cafés. In Oslo, the peace and repose of the great outdoors can be found just minutes away from the city center. The city is framed by the 100-kilometer-long Oslo fjord and surrounded by rolling hills, vast parks and lush forests, which means that the pure pleasures of nature are easily accessible. The capital of the southern coastal region known as the Norwegian Riviera, Kristiansand has earned the nickname “Summer City.” The Gulf Stream keeps temperatures mild and snow to a minimum, so Kristiansand is Norway’s outdoor playground. Even with just a few hours, Kristiansand’s grid layout makes it simple to get around on foot to explore historic sites such as Posebyen (the old town), which dates back to 1631, and former military fortresses and installations. Within the city limits are a number of forested recreational areas, a fish market with harbor views and even a sandy beach. The coastline is dotted with islands, skerries and picturesque fishing villages and farther afield, highlights of the region include Kristiansand Zoo & Amusement Park, the quaint town of Lillesand and Setesdal Mineral Park, with glittering displays of crystals and gems. Before this port city on Norway’s western coast earned its status as the epicenter of “black gold” and the extraction of North Sea oil, it was a shipbuilding and fish-canning town. Fuelled by its wealth as one of the world’s top energy capitals, it’s now home to top-notch fusion restaurants and a bustling nightlife that caters to a never-ending influx of expatriates. Amidst this financial boom, though, Stavanger has managed to hold on to its heritage and soul: Archaeological museums and reconstructed settlements pay due reverence to the city’s Viking past. The cobblestoned Old Town is a well-preserved core of white wooden cottages near an Anglo-Norman cathedral, the oldest in Norway. Natural beauty abounds, too, with the nearby Lysefjord and its impressive Preikestolen (“The Pulpit Rock”) drawing a steady stream of visitors during the summer. Off the Aurlandsfjord, a branch of the larger Sognefjorden in southern Norway, Flåm—and its surrounding area—is a place to stop, gaze and linger. There are no traffic lights; instead the village has an easy pastoral rhythm. Explore the steep-sided fjords and hike through sweeping valleys and meadows, home to grazing sheep. See the frozen-in-time churches and architecture and visit traditional farms where geitost or brown goat’s-milk cheese is made. There are many ways to take in the majestically beautiful landscapes, some designated UNESCO World Heritage Sites, and many are easily accessible. You have only to pick and choose: Embark on a wildlife-spotting cruise through the fjords' narrow passageways or go on a kayaking or cycling excursion that passes by gushing waterfalls. The Flåm Railway runs on a winding route on sheer slopes that reach up to 863 meters above sea level. Or see the area at true Flåm pace, with a simple picnic on the shore. *Conditions Apply: Prices are per person, capacity controlled and listed in Australian dollars twin share including port taxes. Prices may fluctuate if surcharges, fees, taxes or currency change, and may be withdrawn at any time. Prices shown here are not shown in real time. While we endeavour to keep our pricing as up-to-date as possible, the advertised prices shown here may differ from the live prices in our booking system. The prices shown are for a cash payment. Credit card fees of up to 2.5% will apply. Prices are per person twin share based on best available cruise fare, inclusive of all discounts unless otherwise stated. All offers are capacity controlled and can be withdrawn or modified at any time without notice and subject to availability at time of booking. Outside and Balcony cabins may have obstructed views and Suite cabins comprises Junior Suites, Mini Suites and any other type of suite that represents the best value for each cruise. ^Onboard credit is non-refundable, non-transferable and cannot be redeemed for cash or used in the Medical centre or Casino. ~Specialty restaurants may incur a surcharge. All passports, vaccinations and visas are the responsibility of the travelling guest to secure prior to departure from Australia. Some cruise lines reserve the right to impose a fuel levy if the NMEX price reaches a certain level - please check with your consultant at time of booking. Cruise deposit, amendment and cancellation conditions apply. Travel agent service fees not included. Special conditions apply - please ask for full details at time of enquiry. Please note only residents with an Australian address are eligible to book Australian rates in Australian dollars. This cruise package is provided by Seven Oceans Cruising, please ask your travel agent to contact us for more information.